Nobari, A., Kheirkhah, A., Esmaeili, M. (2019). Considering chain to chain competition in forward and reverse logistics of a dynamic and integrated supply chain network design problem. Journal of Industrial and Systems Engineering, 12(1), 147-166. Arash Nobari; Amir Saman Kheirkhah; Maryam Esmaeili. "Considering chain to chain competition in forward and reverse logistics of a dynamic and integrated supply chain network design problem". 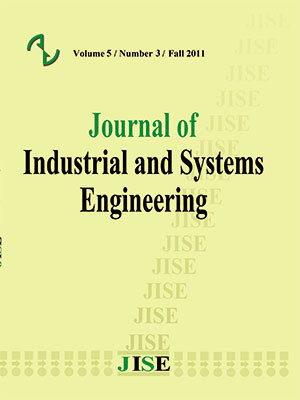 Journal of Industrial and Systems Engineering, 12, 1, 2019, 147-166. Nobari, A., Kheirkhah, A., Esmaeili, M. (2019). 'Considering chain to chain competition in forward and reverse logistics of a dynamic and integrated supply chain network design problem', Journal of Industrial and Systems Engineering, 12(1), pp. 147-166. Nobari, A., Kheirkhah, A., Esmaeili, M. Considering chain to chain competition in forward and reverse logistics of a dynamic and integrated supply chain network design problem. Journal of Industrial and Systems Engineering, 2019; 12(1): 147-166. In this paper, a bi-objective model is presented for dynamic and integrated network design of a new entrant competitive closed-loop supply chain. To consider dynamism and integration in the network design problem, multiple long-term periods are regarded during planning horizon, so that each long-term period includes several short-term periods. Furthermore, a chain to chain competition between two rival supply chains is considered in both forward and reverse logistics. In the forward logistics, the rivals have to compete on the selling price, while in the reverse logistics, the supply chains compete on incentive buying price to achieve more market share. To solve the competitive stage of the proposed model, a game theoretic approach, which determines the selling and incentive buying prices of forward and reverse logistics, is used. Based on the competitive stage’s outputs, the resulted dynamic and integrated network design stage is solved using a Pareto-based multi-objective imperialist competitive algorithm. Finally, to evaluate efficiency of the proposed model and solution approach, a numerical study is implemented. Accorsi, R. Manzini, R., Pini, C. & Penazzi, S. (2015). On the design of closed-loop networks for product life cycle management: Economic, environmental and geography considerations”, Journal of Transport Geography, 48, 121–134. Atashpaz-Gargari, E., & Lucas, C. (2007). Imperialist Competitive Algorithm: An algorithm for optimization inspired by imperialist competition”, IEEE Congress on Evolutionary Computation. Badri, H., Bashiri, M., & Hejazi, T.H. (2013). Integrated strategic and tactical planning in a supply chain network design with a heuristic solution method. Computers & Operations Research, 40 (4), 1143–1154. Bilir, C., Onsel Ekici, S., Ulengin, F. (2017). An integrated multi-objective supply chain network and competitive facility location model. Computers & Industrial Engineering, 108, 136–148. Deb, K., Pratap, A., Agarwal, S., & Meyarivan, T. (2002). A fast and elitist multi-objective genetic algorithm: NSGA-II. IEEE Transactions on Evolutionary Computation, 6, 182–197. Dubey, R., Gunasekaran, A., &Childe S.J. (2015). The design of a responsive sustainable supply chain network under uncertainty. International Journal of Advanced Manufacturing Technology, 80 (1), 427-445. Enayatifar, R., Yousefi, M., Abdullah, A.H., & Darus, A.N. (2013). MOICA: A novel multi-objective approach based on imperialist competitive algorithm. Applied Mathematics and Computation, 219, 8829–8841. Fahimi, K., Seyedhosseini, S.M., & Makui, A. (2017a). A decentralized multi-level leader-follower game for network design of a competitive supply chain, Journal of Industrial and Systems Engineering, 10(4), 1-27. Fahimi, K., Seyedhosseini, S.M., & Makui, A. (2017b). Simultaneous competitive supply chain network design with continuous attractiveness variables. Computers & Industrial Engineering, 107, 235–250. Fallah, H., Eskandari, H., & Pishvaee M.S. (2015). Competitive closed-loop supply chain network design under uncertainty. Journal of Manufacturing Systems, 37 (3), 649–661. Fattahi, M., Mahootchi, M., Govindan, K., & Moattar Husseini, S.M. (2015). Dynamic supply chain network design with capacity planning and multi-period pricing. Transportation Research Part E, 81, 169–202. Fattahi, P., Hajipour, V., & Nobari, A. (2015). A Bi-objective Continuous Review Inventory Control Model: Pareto-based metaheuristic algorithms. Applied Soft Computing, 32, 211–223. Ghavamifar, A, Sabouhi, F., & Makui, A., (2018). An integrated model for designing a distribution network of products under facility and transportation link disruptions, Journal of Industrial and Systems Engineering, 11(1), 113-126. Govindan, K., Jafarian, A., & Nourbakhsh, V. (2015). Bi-objective integrating sustainable order allocation and sustainable supply chain network strategic design with stochastic demand using a novel robust hybrid multi-objective metaheuristic. Computers & Operations Research, 62, 112-130. Govindan, K., Soleimani, H., & Kannan, D. (2015). Reverse logistics and closed-loop supply chain: A comprehensive review to explore the future. European Journal of Operational Research, 240, 603–626. Hafezalkotob, A., Babaei, M.S., Rasulibaghban, A., & Noori-daryan M. (2014). Distribution Design of Two Rival Decenteralized Supply Chains: a Two-person Nonzero Sum Game Theory Approach. InternationalJournal of Engineering Transaction B: Application, 27, No. 8, 1233-1242. Hosseini-Motlagh, S.M., Nematollahi, M., & Nouri, M., (2018). Coordination of green quality and green warranty decisions in a two-echelon competitive supply chain with substitutable products, Journal of Cleaner, 196, 961-984. Kamali, H., Sadegheih, A., Vahdat-Zad, M. & Khademi-Zare, H. (2014). Deterministic and metaheuristic solutions for closed-loop supply chains with continuous price decrease. International Journal of Engineering, 27 (12), 1897-1906. Kaya, O., Urek, B. (2015). A Mixed Integer Nonlinear Programming Model and Heuristic Solutions for Location, Inventory and Pricing Decisions in a Closed Loop Supply Chain. Computers & Operations Research, 65, 93-103. Keyvanshokooh, E., Fattahi, M., Seyed-Hosseini, S.M., & Tavakkoli-Moghaddam R. (2013). A dynamic pricing approach for returned products in integrated forward/reverse logistics network design. Applied Mathematical Modelling, 37, 10182–10202. Liu, Z., Qiu, T., & Chen, B. (2014). A study of the LCA based biofuel supply chain multi-objective optimization model with multi-conversion paths in China. Applied Energy, 126, 221-234. Ma, P., Zhang, C., Hong, X., & Xu, H., (2018). Pricing decisions for substitutable products with green manufacturing in a competitive supply chain, Journal of Cleaner Production, 183, 618-640. Makui, A., & Ghavamifar, A., (2016). Benders Decomposition Algorithm for Competitive Supply Chain Network Design under Risk of Disruption and Uncertainty, Journal of Industrial and Systems Engineering, 9, 30-50. MATLAB Version 7.10.0.499 (R2010a). The MathWorks, Inc. Protected by U.S. and international patents. Melo, M.T., Nickel, S., & Saldanha-da-Gama F. (2009). Facility location and supply chain management – a review. European journal of operation research, 196, 401–412. Mota, B., Gomes, M.I., Carvalho, A., & Barbosa-Povoa A.P. (2014). Towards supply chain sustainability: economic, environmental and social design and Planning. Journal of Cleaner Production, 105, 14-27. Nagurney, A., Dong, J., & Zhang D. (2002). A supply chain network equilibrium model. Transport Research Part E, 38, 281–303. Nobari, A., Kheirkhah, A.M., & Esmaeili, M. (2016). Considering pricing problem in a dynamic and integrated design of sustainable closed-loop supply chain network. International Journal of Industrial Engineering and Production Research, 24 (4), 353-371. Nobari, A., Kheirkhah, A.S., & Esmaeili, M, (2018). Considering chain-to-chain competition on environmental and social concerns in a supply chain network design problem, International Journal of Management Science and Engineering Management, https://doi.org/10.1080/17509653.2018.1474142. Pishvaee, M.S., & Razmi, J. (2012). Environmental supply chain network design using multi-objective fuzzy mathematical programming. Applied Mathematical Modelling, 36, 3433–3446. Rahmani, D., & Mahoodian, V. (2017). Strategic and operational supply chain network design to reduce carbon emission considering reliability and robustness. Journal of Cleaner Production, 149, 607–620. Saghaeeian, A., & Ramezanian, R., (2018). An efficient hybrid genetic algorithm for multi-product competitive supply chain network design with price-dependent demand, Applied Soft Computing, 71, 872-893. Shen, Z.J. (2007). Integrated supply chain design models: a survey and future research directions. Journal of Industrial and Management Optimization, 3No. 1, 1–27. Shi, J., Zhang, G., & Sha, J. (2011a). Optimal production and pricing policy for a closed loop system. Resources, Conservation and Recycling, 55, 639–647. Shi, J., Zhang, G., & Sha, J. (2011b). Optimal production planning for a multi-product closed loop system with uncertain demand and return. Computers & Operation Researches, 38 (3), 641-650. Simchi-Levi, D., Kaminsky, P., & Simchi-Levi, E. (1999). Designing and managing the supply chain: concepts, strategies, and cases. New York: McGraw-Hill. Soleimani, H., Govindan K., Saghafi, H., & Jafari, H. (2017). Fuzzy multi-objective sustainable and green closed-loop supply chain network design. Computers & Industrial Engineering, 109, 191–203. Rabbani, M., Keshvarparast, A., & Farrokhi-Asl, H., (2016). Comparing supply side and demand side options for electrifying a local area using life cycle analysis of energy technologies and demand side programs, Journal of Industrial and Systems Engineering, 9(4),1-8. Rezapour, S., Zanjirani Farahani, R. (2010). Strategic design of competing centralized supplychain networks for markets with deterministic demands. Advance in Engineering Software, 41, 810–22. Rezapour, S., Zanjirani Farahani, R, Ghodsipour, S.H., & Abdollahzadeh, S. (2011). Strategic designof competing supply chain networks with foresight. Advance in Engineering Software, 42, 130–41. Rezapour, S., Zanjirani Farahani, R., & Drezner, T. (2011). Strategic design of competing supply chain networks for inelastic demand. Journal of Operation Research Society, 62, 1784–95. Wu, X., Zhou, Y., (2017). The optimal reverse channel choice under supply chain competition, European Journal of Operational Research, 259(1), 63-66. Yazdi, A., Honarvar M. (2015). A Two Stage Stochastic Programming Model of the Price Decision Problem in the Dual-channel Closed-loop Supply Chain. InternationalJournal of Engineering Transaction B: Application, 28 (5), 738-745. Yousefi Yegane, B., Nakhai Kamalabadi, I., & Farughi, H. (2016). A Non-linear Integer Bi-level Programming Model for Competitive Facility Location of Distribution Centers. InternationalJournal of Engineering Transaction B: Application, 29 (8), 1131-1140. Zanjirani Farahani, R. Rezapour, S. Drezner, T. & Fallah, S. (2014). Competitive supply chain network design: An overview of classifications, models, solution techniques and applications. Omega, 45, 92–118.